When Zero Tolerance first came on the scene the 0300 is one of their knives that really caught my eye. The graceful curves reminded me of some deep sea mammal while the construction reminded me of a semi truck. So I wasn’t surprised to learn that the 0300 was a collaboration between Ken Onion and the Strider Knife Corporation. Ken Onion is known for making a lot of really nice designs for Kershaw (and now CRKT) and Strider is known for making some of the toughest folders in the world. When you get two powerhouses like this in the same room working on a knife that is made in the USA with the fit and finish Kershaw is known for – well, I start to pay attention. Before we go forward I need to say that “0300” is used to designate the coloration of the knife. All the knives in the 0300 Zero Tolerance line (which include the 0300, 0301 and 0302) are identical except for the color schemes. Pictured in this review is the black on black 0300. The ZT 0301 has a Forest Green handle and Tiger Striped blade finish and the ZT 0302 has a Coyote Brown handle with a Tiger Striped blade finish. All 3 knives are made in the USA. The size and heft of this knife are the first things you notice. The 0300 has the profile of a bulldozer and it is incredibly stout. The total length is 9″, the blade is 3-3/4″ and the weight is a solid 8.6 ounces. This is a heavy knife and the weight may deter some people from wanting to carry it. I’ll admit, it’s not my ideal EDC and this is definitely a knife that you don’t forget that is in your pocket, but I have carried it no problem with a sturdy pair of shorts or jeans. I feel that whether the knife is “too heavy” is up to you, so I’m not going to pass judgment in that regard. The blade is a modified drop point, marked by Ken Onion’s signature styling. It features a high flat grind, and a partial swedge near the top. What I really like about this knife is the big belly on the blade. This is great for utility tasks. The blade steel is thick (4mm) and it holds the thickness all the way to the tip. This knife wasn’t designed for stabbing, it was designed to hold up to hard use tasks. There is a nice subtle recurve for enhanced slicing power and the Zero Tolerance logo and various other insignia has been laser etched onto the blade. The steel on the 0300 series is a large piece of S30V. For those unfamiliar with S30V, it is one of the finest knife steels available, and it’s been this way for a number of years now. More expensive steels have arrived on the scene but it’s really tough to match the combination of ease of sharpening, edge retention and corrosion resistance that S30V is known for. The blade has been further treated with a Tungsten DLC (Diamond Like Carbon) Coating. This is a high quality blade coating that will hold up a lot better than more inexpensive painted coatings. The tiger stripes on the 0301 and 0302 are really killer and quite unique in the production knife world. The handle of the 0300 is really well done. As far as construction goes, on one side we have textured G10 over a stainless steel liner. The other side (the lock side) is made of a single piece of titanium. There is a G10 spacer between the two sides and everything has been screwed together. Everything lines up flush, and it’s all been beautifully finished with no rough edges or anything of that nature. Ergonomics on the 0300 are excellent. The handle has the same wide profile of the blade and it feels very satisfying in the hand. The flipper doubles as a choil and there is a generous amount of jimping on the thumb ramp and pommel. Both sides of the handle are machined with a very aggressive textured pattern. All of these elements combine to provide superior grip and response. I am not worried about my hand slipping forward on the knife at all. It is very comfortable to hold this knife, with zero hot spots. The 0300 is a large knife so I expected good ergonomics, but the designers really went out of their way to cover all of the bases. I am very impressed with the ergonomics of this knife. The pocket clip of the 0300 is straight out of the Kershaw parts bin. I have an almost identical clip on my Skyline (and a number of other Kershaw knives). That is ok though, because this is a proven clip design, it’s simple, and it totally works. This is a very stiff clip, which works well with the flat and wide profile of the knife; it will hold the knife in place anywhere in your pocket. Heavy knives have a tendancy to sink down to the corners of my pants pockets, which can interfere with some of the other gear I carry (like my flashlight). The stiffness of the 0300’s clip avoids that issue. Another great thing about the clip is that it is mountable on all 4 corners of the knife. This gives you the freedom to carry your knife the way you want to. I also like how the clip has been blackened. All in all this is a very secure and discreet carry, I am very pleased with how well everything works considering it such a heavy knife. First of all, the 0300 is an assisted opening knife, making use of Kershaw’s SpeedSafe assisted opening technology. With the 0300 you have the option of either deploying the knife with the thumbstuds or flipper. This is really cool because the thumb studs actually work as the stop pin here, and often it’s very difficult to get at the thumbstuds on this type of knife. For me, I had no problem – even left handed, getting at the thumbstuds. Either way you want to deploy the knife, the SpeedSafe quickly engages and moves this big blade out with a good amount of speed. It’s a fun and satisfying knife to open and the SpeedSafe is a proven assisted opening mechanism. Of course, you could always disable this feature if you preferred 100% manual operation. Deployment is not only fast, but it’s very smooth. The 0300 uses a pair of very large phosphor bronze washers. These low friction washers are very smooth. Also, the pivot pin is very big. It’s actually a large bolt that requires a 3/8″ driver to loosen it. This may be problematic in the field, but everyone owns a 3/8″ driver so for my use it wasn’t an issue. I think it’s a pretty cool look and is appropriate given how overbuilt the rest of the knife is. The lock on the 0300 is a titanium frame lock. This is a very sturdy style of lock and ZT really put this one together correctly. As you can see, mine engages nice and early, with plenty of room to break in with use. It almost goes without saying, but there is absolutely no blade play in this knife. Despite the strength of the lock, it is still easy to disengage when you want to fold the knife up. A cool detail is that they included a Hinderer lockbar stabilizer (that dark circular portion) on the side of the lock. This handy feature prevents you from overextending the titanium frame lock, which could compromise the integrity of the knife. A common question a lot people have is whether they want the ZT 0300 or the smaller Zero Tolerance 0350. If you are one of those people, I made a video comparing the two knives. The ZT 0300 is an incredible knife. The build quality is superb, the selection of materials is top notch and the design and features are outstanding. The knife retails for around $230, which is actually an outstanding value when you consider that this knife is very similar in both design and build quality to several Strider knives selling for $400-$500. I don’t think you will be able to find another folding knife as well built and feature rich as the ZT 0300 in the $230 range. Perhaps the biggest complaint would be the weight. It is not a light knife. However, if you want a large, beautiful, hard use folder with premium materials made in the USA then I can safely recommend the 0300 or any of it’s siblings. 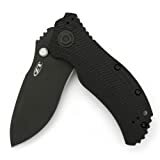 I recommend purchasing the Zero Tolerance 0300 at Amazon.com. Thank you for the kind comment, Felix. I am glad to hear you are enjoying your 303. I know what you are saying – while it’s not a cheap knife, I do agree that you get what you pay for. I hope you enjoy your knife and carry it in good health. Thanks again for stopping by. Great videos, cool knife. I got the zt 550 in my pocket, Do you own most of the knives you review? If you do youve got a great collection… haha my wife would kill me! I find your review of the ZT0350 to be completely at odds with my experience in using it for three years. I have discovered that the edge does NOT sharpen well (it rolls over with only slight sharpening pressure), it does NOT retain edge (even cutting on hard wood for an extended period dulls it, nor does it show corrosion resistance (mine goes dull in only a few weeks of total non use in humid conditions). I bought the knife due to high praise of the S30V steel blade but I have to wonder if mine came from a bad pour. Lastly, the gentle curve you mention has proven to be awful to sharpen if all you try to use is a flat stone. Sorry to hear you are having a poor experience with your ZT0350. First of all, you can’t effectively sharpen the knife on a flat stone unless you use the corner of the stone. You are best off with a sharpening rod. I agree that the recurve is generally harder to sharpen than a straight edge. S30V is not my all time favorite steel (it can be stubborn to sharpen depending on the heat treat), but I have generally had good success with the steel so I am not sure what happened to your particular knife. Maybe the heat treat wasn’t done properly on your model?